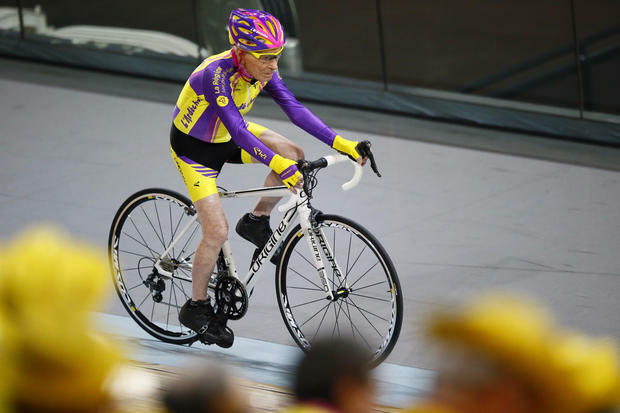 French cyclist Robert Marchand, aged 105, cycled to set a record for distance cycled in one hour, at the velodrome of Saint-Quentin en Yvelines, outside Paris, Wednesday, Jan. 4, 2017. Mr. Marchand set a world record in the 105-plus age category — created especially for the tireless veteran — by riding 22.547 kilometers (14.01 miles) in one hour. “If the president of his teenage club who told him he was not made for cycling because he was too small could see him today, he would kick himself,” Marchand’s coach and good friend Gerard Mistler told the AP. According to Mistler, the secret behind Marchand’s longevity relates to his healthy lifestyle: eating a lot of fruits and vegetables, no smoking, just the occasional glass of wine and exercising on a daily basis. “He never pushed his limits, goes to bed at 9 p.m. and wakes up at 6 a.m., there’s no other secret,” Mistler said.